U.S. News & World Report, a nationally recognized publisher of consumer advice and information, today announced the 2016 Best Cars for Families. U.S. News evaluated 256 vehicles and named winners across 21 categories. The awards are published on the U.S. News Best Cars website at http://usnews.com/cars-families. The 2016 Best Cars for Families winners have the best combination of safety and reliability ratings, excellent reviews from the automotive press and the space and features that keep the entire family happy. New high-tech features, such as in-car wireless Internet, teen driver controls and smartphone apps, were considered alongside traditional criteria such as passenger and cargo space. 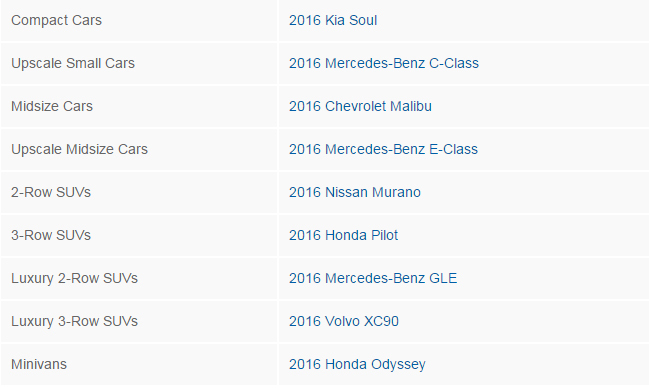 Mercedes-Benz and Honda tied with the most awards won by individual brands, taking home four awards each. Mercedes-Benz won half of the awards in the eight luxury categories. What sets the brand apart from its competitors are features in the C-Class, GLE and GLC – such as in-car Wi-Fi, rear-seat USB ports, tri-zone climate controls, hands-free liftgates and rear sunshades – that make traveling with a family more comfortable. Honda's models are among the top picks for families because of their large cargo spaces – ideal for strollers, grocery bags and more. For the sixth consecutive year, the Honda Odyssey won Best Minivan for Families, the longest streak in the awards' history. The Odyssey's available features, such as a 16-inch rear-seat entertainment screen that can show two different movies side-by-side, a built-in vacuum and a power liftgate, can make life a little easier for parents who have their hands full. In addition, professional car critics say the Odyssey has great driving dynamics, unlike other minivans. Two award categories, Subcompact SUVs and Luxury Subcompact SUVs, are all-new for 2016, with the Honda HR-V winning Best Subcompact SUV for Families and the BMW X1 winning Best Luxury Subcompact SUV for Families. "Finding the best family car can be a time-intensive process," said Jamie Page Deaton, managing editor of U.S. News Best Cars. "Whether you need extra room for car seats or want to monitor your new teen driver, the Best Cars for Families have options for every type of family." Of the 21 Best Cars for Families winners, six are also winners of the 2016 Best Cars for the Money awards because of their excellent long-term value. For the full set of winners and finalists, visit http://usnews.com/cars-families. The award methodology combines professional automotive reviews, safety and reliability ratings, seating and cargo volume and the availability of family-friendly features. Within each of the 21 automotive categories, the vehicle with the highest composite score is named the Best Car for Families in that category. Since 2007, U.S. News Best Cars, the automotive channel of U.S. News & World Report, has published rankings of the majority of new vehicles sold in America. Each year, U.S. News publishes the Best Cars awards, including Best Vehicle Brands, Best Cars for the Money and Best Cars for Families. U.S. News Best Cars had over 45 million unique visitors over the past year, with over 65 percent of visitors actively shopping for a car. Eighty percent of active shoppers reported that the U.S. News Best Cars site influenced their car purchasing decision. U.S. News & World Report is a digital news and information company that empowers people to make better, more informed decisions about important issues affecting their lives. Focusing on Education, Health, Personal Finance, Real Estate, Travel, Cars and News & Opinion, www.usnews.com provides consumer advice, rankings, news and analysis to serve people making complex decisions throughout all stages of life. More than 35 million people visit www.usnews.com each month for research and guidance. Founded in 1933, U.S. News is headquartered in Washington, D.C. This entry was posted in Insight Articles on March 11, 2016 by Administrator. New vehicle sales are still red hot and sport-utility vehicles are among the vehicles generating the heat these days, in particular compact SUVs. Small SUVs offer buyers a lot of upside: elevated ride height and four-wheel drive capability as well as good gas mileage allowing buyers to hedge against a return to gas prices above $3 a gallon some day. Picking up on the Trends! Perhaps their best selling point is the selling price: a well-equipped small SUV can be had for less than $25,000. “The country is having a love affair with small SUVs right now, and Kelley Blue Book visitors are especially infatuated,” said Jack R. Nerad, executive editorial director and executive market analyst for Kelley Blue Book’s KBB.com. In fact, there are more than a dozen choices in that segment and selection, which is best can be a dizzying task. 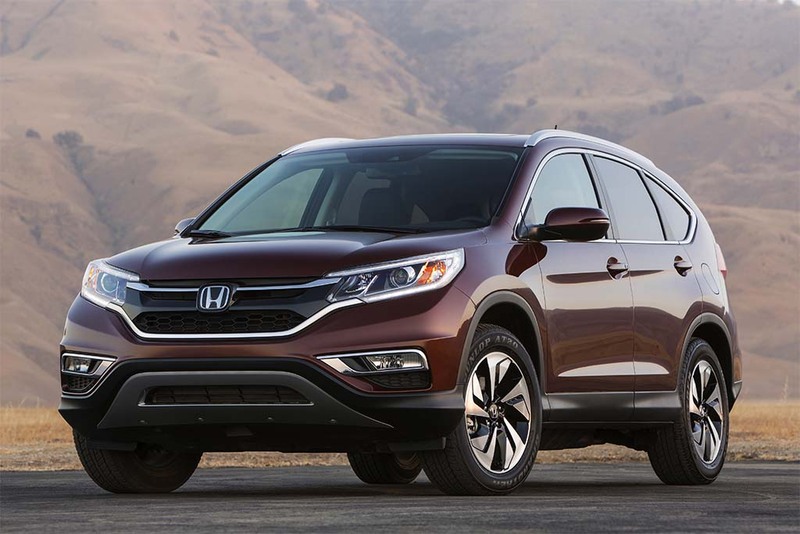 However, KBB.com’s editors have taken the time to drive all of the offerings and provide a top 10 list of what they think are the best choices and the Honda CR-V came out on top. Not surprisingly, it’s also one of the group’s top 16 Best Family Cars of 2016. Perhaps the biggest surprise on the list is the Tucson. “A no-show on this list last year, Hyundai’s small SUV grabs the number three slot this year on the strength of a complete redesign that makes it more refined and even more stylish,” the site said. This entry was posted in CRV Articles on March 8, 2016 by Administrator.